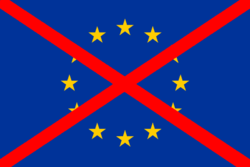 Euroskepticism (also spelled "Euroscepticism") refers to the political philosophy opposed to the European Union and its increasingly centralized, federalist, and socialist powers. Most Euroskeptics are conservative, libertarian, and populist, although some people on the Left also held to their own version of Euroskepticism. Adherents of Euroskepticism are known as Euroskeptics. Globalists and supporters of a completely federalized European country oppose Euroskeptics. The Eurozone Crisis and the European migrant crisis are among the factors attributed to the growth of Euroskepticism. Euroskepticism is contrasted by Europhiles, who support further European integration. Euroskepticism has its roots in the political and economic unification and integration of the European Union. One could see Euroskepticism in action in the 1990s, when the Maastricht Treaty was being adopted by EU nations. Denmark rejected the treaty, and France barely approved it. Additionally, Switzerland rejected joining the European Economic Area in 1992, and Norway rejected a referendum to join the EU. Many Euroskeptic parties grew during this period. Brexit results. Blue-shaded areas stand for council areas that voted "Leave". Orange stands for "Remain". A new wave of Euroskepticism resulted from the Eurozone Crisis, which began in 2009, and the European migrant crisis, which began a few years later. Euroskeptic parties performed strongly in the 2014 European parliament elections, with such parties in the United Kingdom, France, and Denmark gaining the most seats in their respective countries. This Euroskepticism came despite the EU spending nearly $1 trillion on public works projects throughout its member states in order to unify the continent. In the 2015 Swiss federal elections, the Swiss People's Party received 29.4 percent of the vote and 65 seats in the 200-seat National Council, a record amount for the party. No Swiss political party had exceeded the SVP's share of the vote in at least a century, and no party received more seats in the National Council since 1963, when the number of seats was established at 200. In May 2015 Polish presidential election, conservative and Euroskeptic challenger Andrzej Duda of the moderately-Euroskeptic Law and Justice (PiS) won in an upset, defeating the pro-EU incumbent. In the October 2015 general election, PiS won in a landslide, becoming the first Polish party to win enough votes to govern the country alone since the fall of communism in 1989. This landslide election frightened Europeanist leaders and politicians. In the first round of the 2016 Austrian presidential election, Freedom Party of Austria candidate Norbert Hofer received 35.1 percent of the vote, which at the time was the party's best result in a national election in history. Hofer lost the run-off election by less than one percentage point, and again received a relatively large percentage for a Euroskeptic party in a rerun later that year. The Freedom Party of Austria surged in the 2017 legislative elections, and while it received third place, it successfully shifted the establishment Austrian People's Party to the Right on issues such as immigration. On June 23, 2016, the United Kingdom voted to leave the EU. In the 2017 Dutch general election, the Party for Freedom became the second strongest party by receiving its best result ever. French National Front candidate Marine Le Pen received second place in the first round of the 2017 French election on April 23 with over 21% of the vote, meaning she advanced to the second round to face liberal globalist candidate Emmanuel Macron. Le Pen lost the election with just under 34% of the vote, the election was a victory for her in a sense as it showed that she, her party, and their ideas had entered and were influencing the French mainstream. Soon after the election, it was revealed that even if Le Pen had won, the liberal elite in France would have taken steps to keep her from actually welding power. While the AfD was unable to gain any seats in the German national parliament in the 2013 election, it entered the Bundestag in the 2017 election after taking a historic third place with nearly 13% of the vote, while Angela Merkel's CDU received its worst result since 1949. Despite this, Merkel continued defending her open borders policies. The 2017 Czech parliamentary election resulted in major gains for Euroskeptic and anti-establishment parties and major losses for the Left. At first place was the populist ANO, led by Andrej Babis, who has been compared to U.S. President Donald Trump and has criticized the European Union and immigration. The Freedom and Direct Democracy (SPD) party, a new and solidly right-wing and Euroskeptic party, reached a close 4th place, exceeding expectations. The three Euroskeptic and right-wing parties that won seats, the ANO, ODS, and SPD, won a combined 51.6% of the popular vote, while the Social Democratic Party won its worst-ever result, at 7.27%, and the Communist Party also saw massive losses, winning only 7.76%. In Italy's 2018 general election, populist and Euroskeptic parties received over 50% of the vote, and the Five Star Movement and Lega Nord formed Western Europe's first fully populist and anti-establishment government. Results of the 2015 Swiss federal election in October 2015. Each canton is shaded according to the party that won the most votes for the National Council (lower house). The Euroskeptic Swiss People's Party is shaded dark green, and it won the largest popular victory for a Swiss political party in at least a century. ↑ 1.0 1.1 1.2 1.3 1.4 Michael Ray. Euroskepticism. Encyclopædia Britannica. Retrieved July 10, 2017. ↑ Miserez, Marc-Andre (December 2, 2012). Switzerland poised to keep EU at arm's length. Swissinfo. Retrieved August 16, 2016. ↑ Switzerland and the European Union (PDF) (2nd ed.). Federal Department of Foreign Affairs. 2016. Retrieved August 16, 2016. Murray, Douglas (October 3, 2015). Euroscepticism is growing all over Europe. The Spectator. Retrieved July 10, 2017. Wright, Oliver (June 7, 2016). Euroscepticism on the rise across Europe as analysis finds increasing opposition to the EU in France, Germany and Spain. The Independent. Retrieved July 10, 2017. Foster, Peter (June 7, 2016). It's not just the Brits: Euroscepticism on the rise all across Europe, major survey shows. The Telegraph. Retrieved July 10, 2017. Boffey, Daniel (March 3, 2017). Rising Euroscepticism 'poses existential threat to EU'. The Guardian. Retrieved July 10, 2017. ↑ After Euroskeptic rise muddles European Union's future, EU leaders must find a way out. Fox News. May 26, 2014. Retrieved July 10, 2017. ↑ Eurosceptic 'earthquake' rocks EU elections. BBC. May 26, 2014. ↑ How Eurosceptic is the new European Parliament?. BBC. Retrieved July 10, 2017. ↑ Synon, M.E. (July 26, 2014). On the Continent: Germany, France and the earthquake. Breitbart News. Retrieved July 10, 2017. ↑ UK European election results. BBC. Retrieved September 8, 2016. ↑ McPartland, Ben (May 25, 2014). European Elections 2014: National Front tops vote. The Local. Retrieved July 10, 2017. ↑ Alexander, Harriet (May 26, 2014). EU election 2014: Danish eurosceptic People's Party wins - and calls for alliance with Cameron. The Telegraph. Retrieved July 10, 2017. ↑ Norman, Laurence; Hinshaw, Drew (August 8, 2018). The EU Spent a Bundle to Unify the Continent. It’s Not Working. The Wall Street Journal. Retrieved August 9, 2018. ↑ 13.0 13.1 Anti-immigration party wins Swiss election in 'slide to the Right'. The Telegraph (originally by Reuters). October 19, 2015. Retrieved October 12, 2016. ↑ Swiss Parliament Shifts To Right In Vote Dominated By Migrant Surge. Breitbart (by AFP). October 19, 2015. Retrieved October 12, 2016. ↑ Conservative Challenger Wins Polish Election, Signaling Rightward Shift. Breitbart News. May 25, 2015. Retrieved March 18, 2017. ↑ In Polish presidential ballot, win by right-wing challenger could signal return to turbulence. Fox News (and AP). May 22, 2015. Retrieved March 18, 2017. ↑ Eurosceptics Claim Victory In Landmark Poland Election. Breitbart News. October 26, 2015. Retrieved March 18, 2017. ↑ Poland elections: Law and Justice party can govern alone. BBC. October 27, 2015. Retrieved March 18, 2017. ↑ Goettig, Marcin; Barteczko, Agnieszka (October 27, 2015). Poland's Eurosceptics win outright majority in parliament. Reuters. Retrieved July 20, 2017. ↑ Poland’s Political Course Sparks Alarm in US and Europe, With Fears of Democratic Backsliding. Breitbart News. December 23, 2015. Retrieved March 18, 2017. ↑ Troianovski, Anton (April 25, 2016). European Right Gets Boost From Austrian Freedom Party Victory. The Wall Street Journal. Retrieved December 17, 2016. ↑ Troianovski, Anton (June 1, 2016). Austrian Court Orders Rerun of Presidential Vote. The Wall Street Journal. Retrieved December 17, 2016. ↑ Oliphant, Roland; Cseko, Balazs (December 4, 2016). Austrian far-right defiant as Freedom Party claims 'pole position' for general election: 'Our time comes'. The Telegraph. Retrieved December 17, 2016. ↑ Austrian Social Democrats Come Second in Tight Election Race. Sputnik. October 20, 2017. Retrieved October 21, 2017. ↑ Nasralla, Shadia; Knolle, Kirsti (October 14, 2017). Austria shifts to right as conservative star seals election win. Reuters. Retrieved October 21, 2017. ↑ Knolle, Kirsti; Nasralla, Shadia (September 5, 2017). Austria's far-right party accuses conservatives of stealing campaign ideas. Reuters. Retrieved October 21, 2017. ↑ Murphy, Francois (July 16, 2017). Win or lose, Austrian far right's views have entered government. Reuters. Retrieved October 21, 2017. ↑ WHAT NOW? 'Brexit' vote puts Britain, EU in uncharted territory. Fox News. June 24, 2016. Retrieved July 10, 2017. ↑ French presidential election: Le Pen, Macron win first round to advance to runoff. Fox News. Retrieved April 23, 2017. ↑ French election first round results 2017 – Macron and Le Pen go through. The Guardian. April 23, 2017. Retrieved April 23, 2017. ↑ Berton, Elena (April 23, 2017). French voters reject establishment, send Macron and Le Pen to presidential runoff. The Washington Times. Retrieved April 24, 2017. ↑ Mohdin, Aamna (May 8, 2017). Marine Le Pen lost the vote but she won something better. Quartz. Retrieved May 8, 2017. ↑ Dettmer, Jamie (May 19, 2017). Media: French Officials Had Secret Plan in Event of Le Pen Win. Voice of America. Retrieved May 22, 2017. Tomlinson, Chris (September 25, 2017). Merkel’s Pyrrhic Victory: Worst Party Performance Since 1949 As Populist AfD Beat Expectations. Breitbart News. Retrieved September 25, 2017. Dettmer, Jamie (September 25, 2017). Germany Shaken by Far-right Political Earthquake. Voice of America. Retrieved September 25, 2017. Dettmer, Jamie (September 25, 2017). Merkel Wins Historic Fourth Term But Far-right Populists Surge. Voice of America. Retrieved September 25, 2017. Ridgwell, Henry (September 25, 2017). German Far-right Pledges to 'Reclaim Country' as Merkel Begins Tough Coalition Talks. Voice of America. Retrieved September 25, 2017. Chazan, Guy (September 24, 2017). Nationalist AfD make historic breakthrough in German elections. Financial Times. Retrieved September 25, 2017. ↑ Merkel Defends Open Borders Migrant Policy After Election Shock. Breitbart News. September 25, 2017. Retrieved September 25, 2017. ↑ 36.0 36.1 Lane, Oliver JJ (October 21, 2017). Surge For Right-Wing Eurosceptic ‘Czech Trump’ at Worst Election in Czech History for Left Party. Breitbart News. Retrieved October 21, 2017. ↑ Moody, John (October 19, 2017). In Czech election, yes means no to European Union slavery. Fox News. Retrieved October 24, 2017. Laca, Peter; Bauerova, Ladka Mortkowitz (October 22, 2017). Czechs Add to EU’s Headache by Electing Euroskeptic Billionaire. Bloomberg. Retrieved October 23, 2017. Gosling, Tim (October 21, 2017). Populist billionaire sweeps to victory in Czech election. The Telegraph. Retrieved October 21, 2017. Czech Trump and insurgent parties benefit from 'voting hurricane' in Czech Republic election. Deutsche Welle. October 21, 2017. Retrieved October 21, 2017. Mortkowitz, Siegfried (October 21, 2017). Czech voters hand Euroskeptic Babiš big victory. Politico. Retrieved October 21, 2017. Witte, Griff (October 17, 2017). In center of Europe, politics takes a Trumpian turn with rise of anti-immigrant billionaire. The Washington Post. Retrieved October 21, 2017. Lyman, Rick (October 17, 2017). In Czech Election, a New Threat to European Unity. The New York Times. Retrieved October 21, 2017. Lopatka, Jan (October 13, 2017). Czech election favourite Babis hard on Brussels, light on ideology. Reuters. Retrieved October 21, 2017. ↑ Muller, Robert; Lopatka, Jan (October 21, 2017). Far-right scores surprise success in Czech election. Reuters. Retrieved October 21, 2017. ↑ 41.0 41.1 Volby do Poslanecké sněmovny Parlamentu České republiky konané ve dnech 20.10. – 21.10.2017. Volby.cz. Retrieved October 21, 2017. Jones, Gavin; Di Giorgio, Massimiliano (June 1, 2018). Italy's Conte sworn in as PM of anti-establishment government. Reuters. Retrieved June 1, 2018. This page was last modified on 9 April 2019, at 06:56.